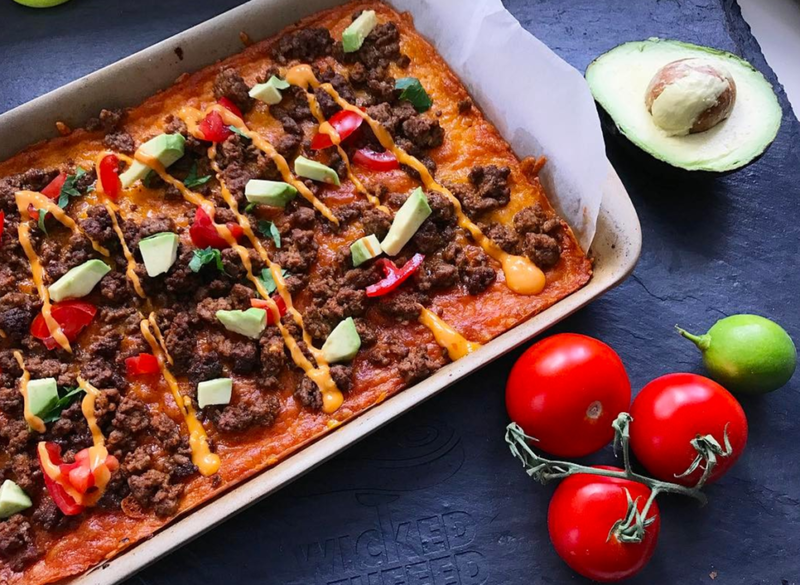 I’ve been looking forward to making this keto taco rolls recipe. I made a batch of taco meat on Sunday and my husband has been trying to eat it all week. I had to keep slapping his taco-stealing hands and saying I AM MAKING A RECIPE WITH THAT all week long. Well the wait is finally over (for me, and also probably him!) I’ve been baking cheese into all kinds of things lately, and after a few rounds of baking cheddar, I knew this one couldn’t possibly fail. And it came out SO GOOD. 2 cups, grated cheddar cheese or enough to cover the bottom of the pan. Add the cold toppings in a single layer. Making sure the parchment isn’t sticking, roll each slice from bottom to top. Enjoy with a salad of any leftovers you have from the rolls! Here’s how it looked before it got sliced & rolled. You can add whatever toppings you like. I went for tomatoes, avocado, sriracha mayo, and some cilantro. Feel free to add onions, olives, or even chopped lettuce! Just make sure you’ve chopped beforehand because you don’t want to let it cool before you roll it! 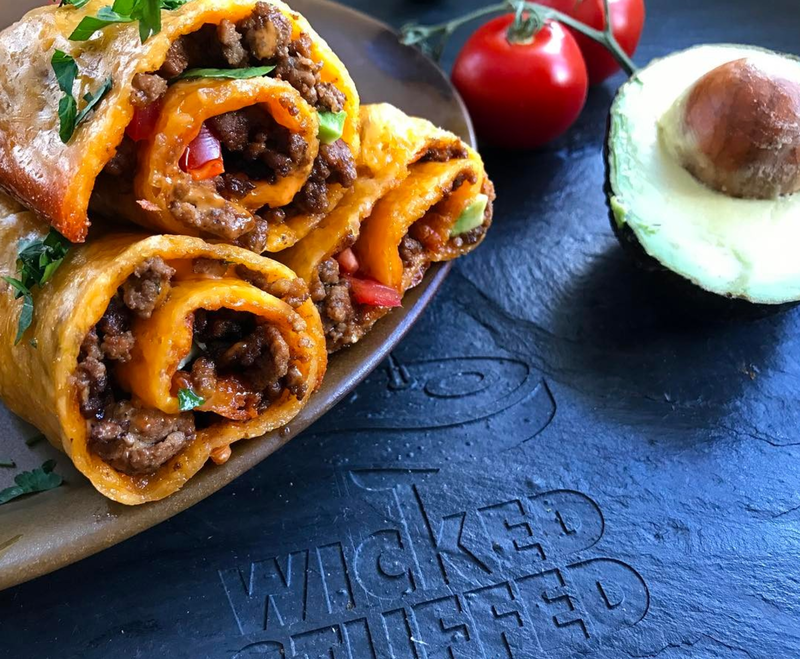 Thanks to all the cheese, these keto taco rolls really fill you up quickly! Add a little salad on the side, and you’re good! If you love tacos be sure to check out my post on How to Make Zero Carb Taco Shells next. Dinner tonight was cheddar wrapped taco rolls! Awesome. You are a genius! My husband and I started keto a week ago, I just found your website yesterday. Kudos! It is great! I made the peanut butter cups this afternoon. Yummy. “taco meat” That cracks me up. Whatever happened to “seasoned ground beef”? Nevertheless, I will try this recipe. Looks delicious. You can “season” meat in many different ways, this happens to taste like “taco” so it is referred to taco meat. Are the nutrition facts per taco or for the entire dish? They’re per serving (there are 3) so if you make 3 tacos it will be per taco. You can also make smaller ones and just keep the three servings in mind. Am i just missing it ? I cant seem to find a print button to print recipes? I would love to know what you use to season the meat! We have been trying to get away from using the taco and burrito seasoning packets but haven’t found a good recipe. cumin, chili powder, paprika, pinch of fennel, salt, pepper, garlic, and onions. Good. But greasy. So much oil from the cheese. Do you think they are okay to make ahead and reheat for lunches? Did you ever get a response for this? Awesome recipe! My family and I loved this! We feel like we got to enjoy a taco! In fact, I think it’s better than a taco! !